The 20bn-euro loan is made up of 14.5bn from euro area member states and 5.5bn euros from the IMF. 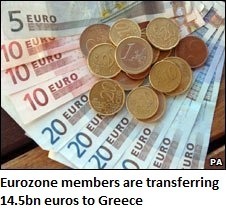 It is the first time Greece has tapped the funds. In return for the loan, the government in Athens is trying to make major austerity cuts – a move which has outraged the public and led to violent clashes in the capital. In a separate development on Monday, a tax scandal led to the dismissal of Greek Deputy Tourism Minister Angela Gerekou. She was forced to go after a newspaper revealed that her husband, a popular singer, owed more than 5m euros in unpaid taxes and fines. Ms Gerekou, a political protegee of Prime Minister George Papandreou, had filed joint tax declarations with her husband for years.